Ready to Eat - Yum! 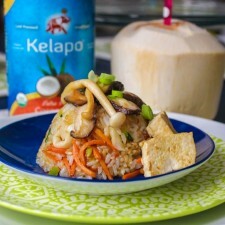 We are so excited to have Kasey Potts from Kasey’s Kitchen on board as our official Kelapo Guest Blogger! Please watch for Kasey’s delicious recipes monthly! As we are about to wrap up Hearth Health month, I wanted to share a fresh new recipe that puts a healthier twist on one of my favorite dishes, Fried Rice! If you’ve ever been to a Japanese Steakhouse or Hibachi Restaurant, you’ve watched the chefs chop and dice and throw their knives around creating beating hearts out of their delicious fried rice, right? It’s my favorite part of a hibachi meal, but have you ever noticed what they are actually throwing into it? You know that wad of garlic butter that they toss in there…that’s the equivalent of a whole stick of butter! No wonder it tastes so darn good! 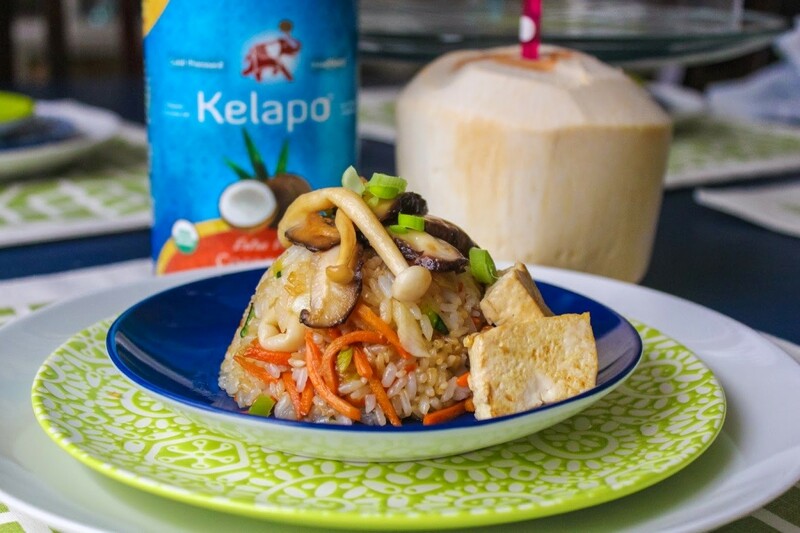 Anyway, when I teamed up with Kelapo Coconut, I knew it would be a great opportunity to play around to tweak this recipe and boost the nutritional value. I’ll be swapping out all that artery clogging butter for nutrient rich coconut oil. Did you know that coconut oil is comprised of medium chain triglycerides (MCTs) \which have been shown to help the body absorb important nutrients and minerals as well as eliminate harmful bacteria and fight signs of aging. So just adding coconut oil into your cooking routine will skyrocket the nutrients of the rest of your meal! Now the fried rice recipe below is delicious on its own, but I paired it with some seared tofu for an extra punch of protein. Soy products, including tofu and soy milk, are a good way to add protein to your diet without unhealthy fats and cholesterol. Soy products contain high levels of polyunsaturated fats (good for your health), fiber, vitamins, and minerals. What’s more, soy may reduce blood pressure in people who eat a diet high in refined carbohydrates. And compared with milk or other proteins, soy protein can actually decrease LDL or “bad” cholesterol. 1. In a large skillet or wok, heat coconut oil over a medium flame. Remember that coconut oil has a very low eat index, so it will get hot very quickly! 2. Add in garlic and the white parts of the green onion. Sautee until tender. 3. At this point, add in the carrots, zucchini, and mushrooms and cook until tender. Sprinkle vegetables with ginger powder and continue to cook. When the mushrooms are soft, add in the cold rice. Mix evenly among the coconut oil and vegetables in the pot. 4. Press rice down against the pan to make a smooth, even surface, almost like an omelet or pancake. When you hear the rice start to crackle, add in the soy sauce and mix. Repeat the pressing down step a few more times until you notice some of the rice starting to crisp. Cook up some teriyaki chicken or seared tofu to accompany the rice if you’d like or enjoy it vegetarian style. Top with some sliced green onion before serving for a pop of color and flavor!